Order your On Stage GTA4000 Clip On Chromatic Tuner with Multi Instrument Modes from AMS and enjoy Fast & Free Shipping. Get the Best Deal with our Lowest Price Guarantee & Great Customer Service! Designed for guitar, bass, ukulele, mandolin, banjo and similar instruments, the GTA4000 Chromatic Tuner will keep you sounding your best. Its tactile transducer picks up vibrations directly through the body of the instrument. This means the GTA4000 works with acoustic or electric instruments without the need for cables, even in noisy environments. The high contrast screen offers excellent visibility in any lighting. The secure clip is designed to grip tight without marring finishes, and can be left on during performances for instant reference. Handy, portable and affordable tuner. 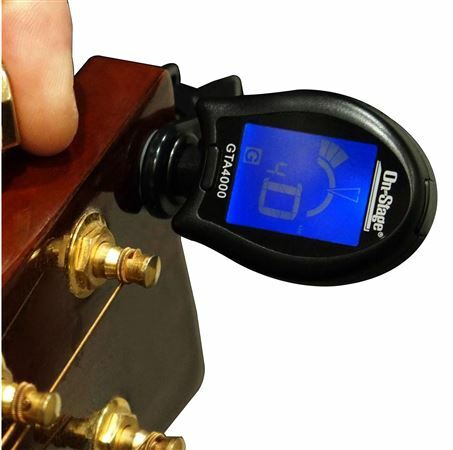 It's great to have a portable tuner that works without having to plug the guitar in. Having easy access to the tuner at all times has improved my guitar-playing by keeping me tuned in between songs. The display is clear and the functions are pretty easy.